Pink buses? They are part of Gray Line New York's "Big Pink Sightseeing" tour, which raises money for breast cancer research. The fleet of Gray Line New York’s red double-decker buses are ubiquitous in New York, winding their way through diverse neighborhoods and streets as they introduce tourists to the city’s most iconic sites. But now, some of those buses have turned pink. On Tuesday at Pier 78 in Manhattan, the tour company will officially launch its new "Big Pink Sightseeing" tour to fund breast cancer research. “It’s the first of its kind in the Big Apple,” said David W. Chien, director of marketing for Gray Line New York. “It’s for a great cause and it’s a great way to see the city.” For every adult ticket purchased, $1 will be donated to The Breast Cancer Research Foundation for its work in the quest to find a cure. Chien said Gray Line has donated the use of buses for charitable events in the past, like toy drives and for World Read Aloud Day, but the four pink buses for the "Big Pink Sightseeing" tour are intended to be permanent. The tour does not follow the hop-on, hop-off format but will feature a guide who will remain on the bus for the entire one and a half hours. “We didn’t want it to be exactly the same” as the red double-decker tours, said Chien. Top landmarks include: Times Square, view of the Statue of Liberty, One World Trade Center, Empire State Building, Central Park, and Rockefeller Center. Other travel-related partnerships have been successful. Delta Air Lines introduced a pink plane “that flies the world,” Franklin said. Delta has raised almost $5 million for the foundation since 2005, more than a million in 2011 alone, by selling pink lemonade during flights and through other marketing and fundraising efforts, she said, and Celebrity Cruises, also now a partner, plans to raise money through a variety of activities on board. The idea for the “Big Pink Sightseeing” tour to raise money for cancer research originated in Nova Scotia, Canada. About five years ago, a bus -- painted pink and turned into a mobile classroom featuring high quality displays, educational videos, and screening equipment -- traveled the four Canadian Atlantic provinces. When the company opened a new office in Saint John, New Brunswick, in the summer of 2010, it painted eight double-decker buses pink. After the four-month summer season, $33,000 was raised, Campbell said. 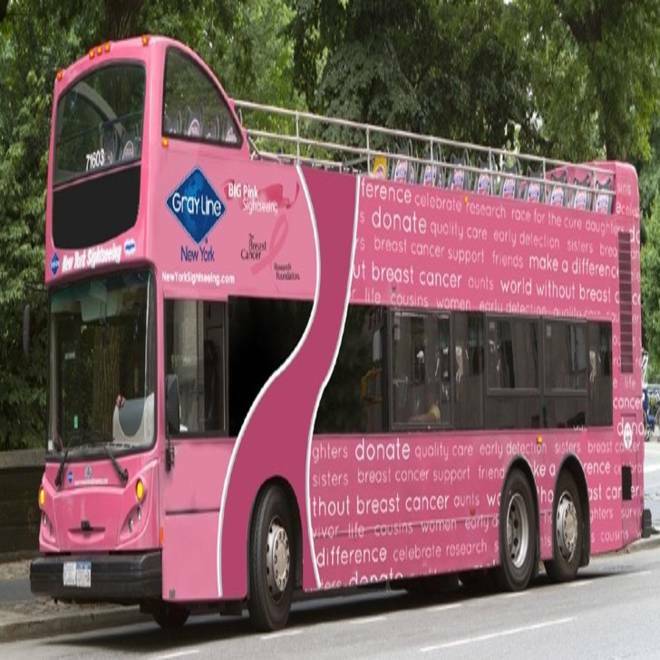 The following summer an additional 25 pink buses were added in the four Maritime Provinces and Vancouver, which raised more than $95,000. Five pink Gray Line buses were also introduced that summer in Portland, Ore. Currently, there are 42 pink Gray Line buses in operation in North America, including the four new ones in New York. Pink buses are planned for Grand Bahama in the Caribbean in November, for Toronto, Quebec City, and Portland, Maine, in summer 2013, and a number of other North American cities are in discussions to do so, Campbell said. Sharr Prohaska, clinical associate professor, Preston Robert Tisch Center for Hospitality, Tourism and Sports Management at New York University, said she was not aware of marketing efforts in the travel industry being used to raise awareness for breast cancer research. “However, why not? If the donation of just a dollar can help find a solution to the disease, then this is an interesting approach,” she said. The bus tours operate daily from 10:30 a.m. to 2:30 p.m., and depart every half hour from the corner of 53rd Street and 7th Avenue in New York City. Tickets cost $49 for adults and $44 for children, aged 3 to 11.